There are some weird games on the market and the whole concept of Akiba’s Trip Undead & Undressed can be one of the weirdest ones in the last few years. Vampire like creatures have been staple enemies in many games before the zombie hoard invaded everything, but the way that players must defeat these vampire like beings is probably the most unique method yet. That being said, does Akiba’s Trip Undead & Undressed warrant a purchase? After blindly accepting an offering for rare figures, the otaku player (who can be named whatever the player wishes) finds himself strapped to a table surrounded by strange men. It is revealed that these men have transformed the player into a Synthister, a man-made vampire like creature capable of draining the life energy from people. Only with the help of a mysterious woman named Shizuku who attacks those keeping the player captive are you able to escape. With the help of Shizuku the player is able to resist falling into temptation like other Synthisters and brings her to his friends, the Freedom Fighters of Akiba (Akihabara), to warn them that the city is in danger of being overrun by these monsters. With Synthisters able to blend in like everyone else and only a few people capable of determining who they might be, the Freedom Fighters are in for quite a fight, especially when a more supernatural aspect begins to come into play. Now Akiba’s Trip Undead & Undressed may have a unique premise, a ton of hilarious dialogue, and Akihabara makes for a great setting, but it unfortunately does very little to actually dig much deeper into the more complicated issues that begin to arise later in the story. Much of the story is presented at surface level only and it is worth noting that this is a standalone story and the lack of detail is not because it was originally the second game in the series. This lack of in-depth detail spreads to the characters themselves as many of them are, once again, surface level archetypes as very little character development occurs in the game. There are different choices that players can make throughout the game that affect their “affection” level with four of the female characters in the story which is a nice touch, as each of these girls have a unique ending, many of which are rather touching I will admit, that adds to the replay value. Defeating a creature that is similar to a vampire sounds like it might be simple being that almost anyone can list off their various weaknesses, but one weakness that every type of vampire has is sunlight and that is the player’s only weapon as well as their weakness. You see, the only way to defeat Synthisters is to strip off all of their clothing and expose them to sunlight; this includes their shirt, pants, and any headgear they might be wearing. As such combat involves the player attacking their clothing more than the enemy themselves, targeting the head, body, and legs with different face button combos. Once an enemy’s clothing is damaged enough it will appear disheveled and flash red, allowing the player to hold that area’s face button to strip that article of clothing from the enemy. Players can gain additional XP and defeat enemies faster by chaining together strip attacks by having numerous enemies weakened at the same time by taking part in a series of quick time events. If you happen to have a high enough strip counter, you can even perform a special finishing move that makes the enemy even drop their underwear. The problem is, the player is just as susceptible to damage and being stripped and burned away in the sunlight. As such players must block and avoid damage and “straighten out” their clothing by holding L1 to recover health. 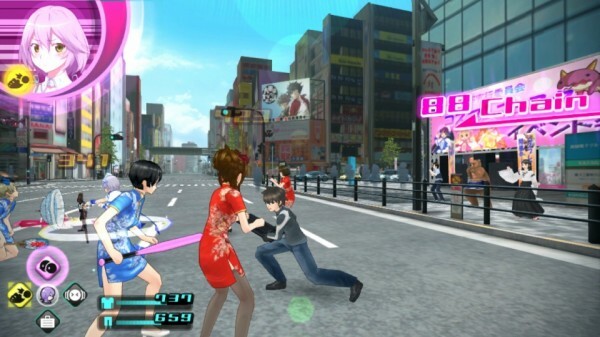 Players can equip all different types of clothing, either purchased from a store or obtained from defeated enemies, to customize their character as they wish, with clothing having higher durability levels and various weapon types offering different attacks, plus special weapons with unique combos of their own. The combat is simplistic but very fun at the same time and players can even choose to upgrade their equipment with the help of their little sister Nana back at the Freedom Fighters’ headquarters, MOGRA. That being said, even on some of the highest difficulty levels the game has to offer the player can easily find themselves overpowering weaker opponents if they happen to upgrade their equipment to much. 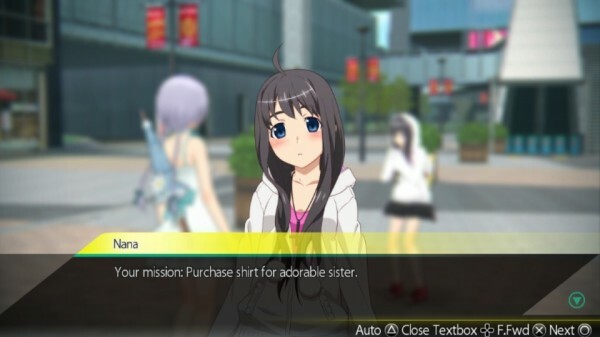 Outside of the main storyline Akiba’s Trip Undead & Undressed offers a ton of side-quests that will see the player traveling through many areas in Akihabara as they finish these tasks that range from defeating roudy fans or stalkers, to tracking down special items, or even completing tasks for your dear shut-in sister. While these side-quests are completely voluntary, many of them are rather funny and they really help extend the life of the game as it is entirely possible to finish Akiba’s Trip Undead & Undressed in under eight hours. 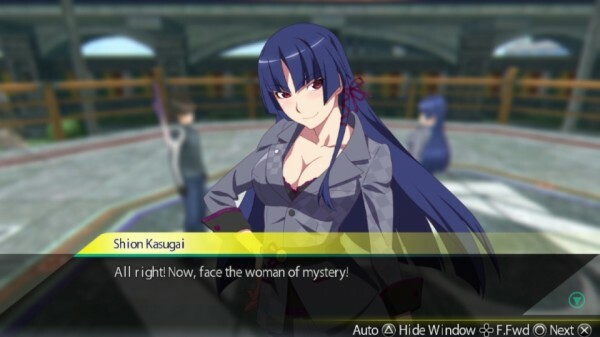 Those looking for some replay value will find that Akiba’s Trip Undead & Undressed does offer a NG+ mode that allows the player to carry over all equipment and money from their last playthrough, the chance to change your character model, as well as a bonus option to display what choices will increase your affection level with certain girls. The title also features an option to fast-forward through dialogue you have read already, which is a nice touch. 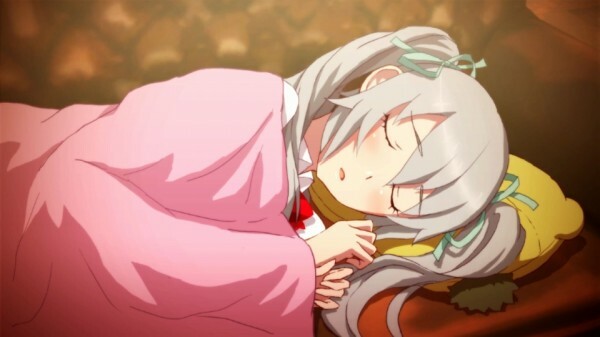 Now before anyone attempts to get up in arms about the fact that Akiba’s Trip allows the player to strip enemies down to their skivvies, the fan service level is very equal as not only do there seem to be more male Synthisters than female at times, XSEED has made the effort to include extra strip CGs for the main male opponents in the game to equal that of the strip CGs that are already in the game for the main members of the female cast. 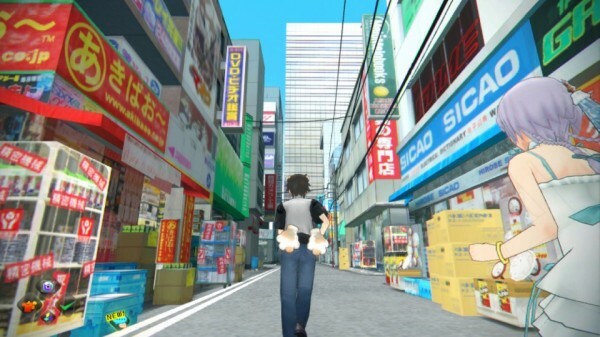 That being said, Akiba’s Trip Undead & Undressed offers an amazing looking replication of Akihabara with nicely detailed buildings and a great layout that even has various promotional videos playing on televisions around the area giving players plenty of references to catch. Even the loading screens reference various Akihabara shops as well as various video games and anime that were being released around the time the game was released in Japan. Heck, one of the main fake anime talked about throughout the story uses character art directly from one of Kaworu Watashiya’s works. Unfortunately the character models themselves can leave something to be desired as there generally isn’t too much detail to be found here on either platform. It is also worth noting that the PlayStation 3 version of the game does suffer from drops in frame rate, the Vita version feels like it is on par with the PS3 version, featuring the same amount of frame rate problems and some longer load times. 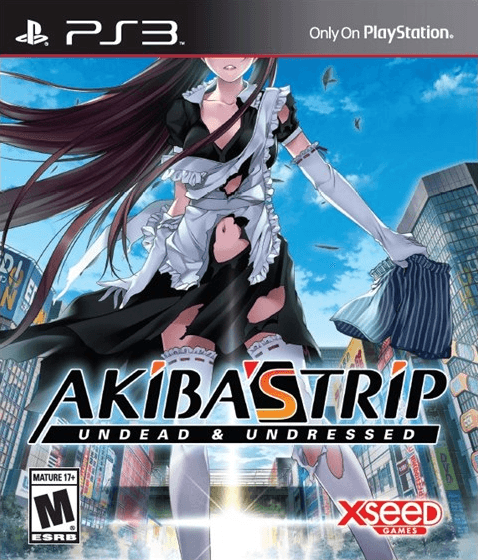 With the release of Akiba’s Trip Undead & Undressed XSEED has included both the newly recorded English voice track as well as the original Japanese voice work. Players can choose to switch between them at will and I must say that outside of one character, the English voice work is handled incredibly well and breathes some extra life into a few characters. Unfortunately the player’s little sister Nana seems to go a complete character change when you switch voice tracks and although the English dub features plenty of bro-terms, her voice work is a step down from that found in the original dub. Outside of that there is a decent set of background music used throughout the game, with the aforementioned videos offering an extra touch as they promote Disgaea 4 or Conception II in the background and treat the player to those games’ opening themes, even though Akiba’s Trip’s opening is great in its own right. 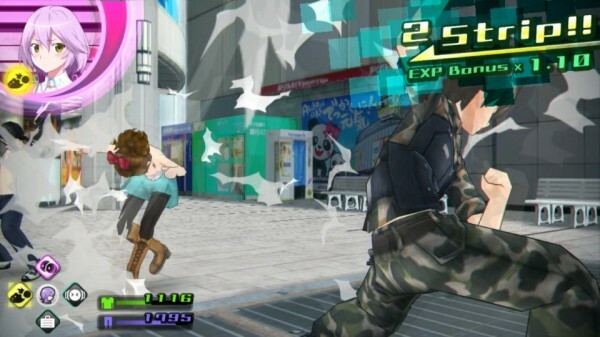 Akiba’s Trip Undead & Undressed is a very strange game but that is a good thing. Although the storyline can leave a bit to be desired, the amount of humor and the cast of characters do a great job making up for that fact. The novel concept of stripping enemies of their clothing to defeat them and the great setting of Akihabara teeming with anime and Japanese references makes for a fun game that feels a bit bare at times but provides a satisfyingly enjoyable experience.